Anic Associates is the leading provider of solutions to the grain logistics sector. Maxis "M100 Series" Grain Hopper (100t gross mass, 25t axleload capacity). Operational codes: VHKY and CGAY. The Maxis grain hopper was designed as a single base platform, which then can be used to build hoppers of varying volumetric capacities, depending on silo and track infrastructure restrictions. To date capacities of 100t and 92t gross mass are the preferred capacities selected by our clients. From a cost perspective, this single platfrom design leads to a lower cost, as production lines and jigs are optimised for a common platfrom. From an operator perspective, inventory costs are minimised due to the standardisation of parts across the grain fleet. Generally, the grain logistics chain involves the transport of grain from the farm to either domestic market or export ports. The "M100 Series" hopper has been designed to transport export grain from high capacity "super silo sites" to export ports. 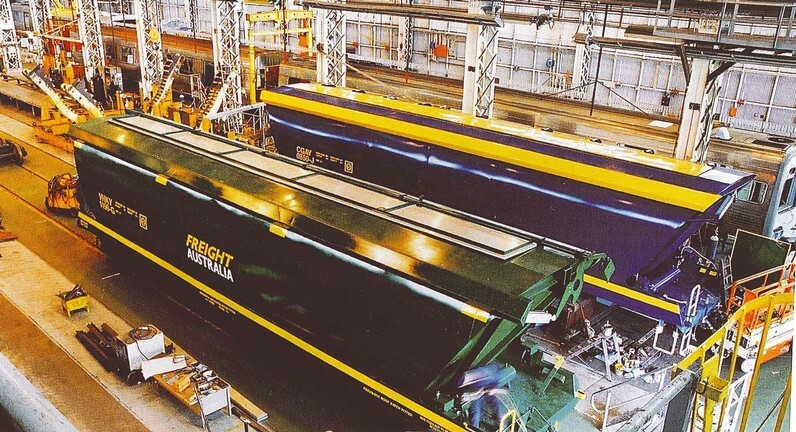 The "M92 Series" hopper has a lower capacity and specifically designed to take into account infrastructure restrictions in regional areas (up-country regional silos). It is primarily aimed at transporting grain from regional silos for domestic consumption. These have been in operational service since 2001, providing efficiency gains and cost savings to our clients.